This series is the ideal way for anyone who is new to movement to learn the basics of a dance technique along with terminology for a particular style of dance. These specifically designed classes will give students the necessary skill sets to attend other drop-in classes with a greater level of confidence and success. Looking for something fun and different to freshen up your date night? Look no further! Bring a partner and it’s only $20 for the two of you (reg. $32) or $130 for the series. No parter? No problem! We have single class payment options, or the series price is just $100 for one dancer. Each series of classes will start with an introduction to the dance style and will work on building patterns and lead/follow skills throughout the lessons. Drop-ins are always welcome but we do recommend you register for an entire series to gain the most from the class. This will give you the choreography, practice time and confidence needed to dance socially. This class will cover both contemporary dance technique (45 min.) and will also explore the choreographic philosophies, processes, and aesthetics of dance-making (45 min.). Various approaches to improvisation and composition will be taught to help dancers discover movement material and challenge movement habits. Invite your friends and family for an informal sharing of works in progress which will take place during the last class. 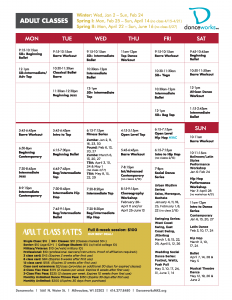 >Click here for descriptions of each dance fitness class. For additional registration help, be sure to check out our step-by-step instructional pdf. Questions? Contact Amy Brinkman-Sustache, Director of Education, at 414.277.8480 x6002 or via email. Danceworks Gift Certificates are great for any occasion!